Work is great and all but I’m certainly not complaining when the weekend comes around. Weekends here follow a pretty similar pattern. Once work finishes on a Friday night, usually around 10pm, I grab some food and run home to get changed out of the shirt and tie before jumping in a taxi for Bupyeong. Incheon’s place to party. 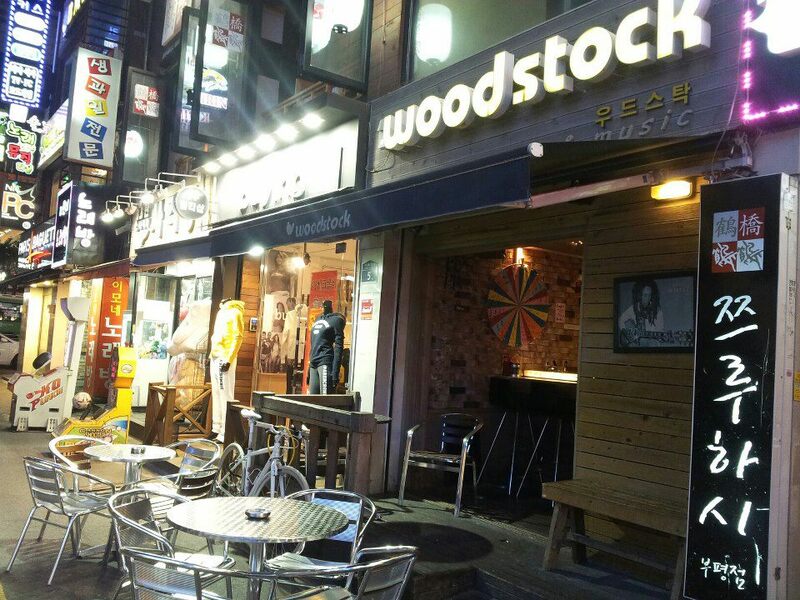 There are a few places to go in Bupyeong but at some point we usually end up in Little Woodstock. A tiny little place that’s usually pretty busy. It’s there that I was bartending Christmas Eve and where I’ve since been offered a Saturday job. I turned it down, don’t want to give up the little free time I have, but it was nice to be offered. Friday night usually finishes around 3 or 4 am, I managed to stay out till 5am last night and today I’m shattered. The hangover I experienced after my first night out in Bupyeong was horrendous, truly horrendous. I feared it would be a regular side effect of drinking in Korea. Luckily Joe discovered that a couple of Tylenol before bed all but eradicates every trace of a hangover. Unless you try running up stairs, then it all comes flooding back. Trust me. I think the reason Korean beer has this effect is because it’s brewed with rice in place of wheat. Not sure if that’s the reason the hangovers are so bad but it’s the only one I can think of. Saturday daytime is time to explore Seoul. 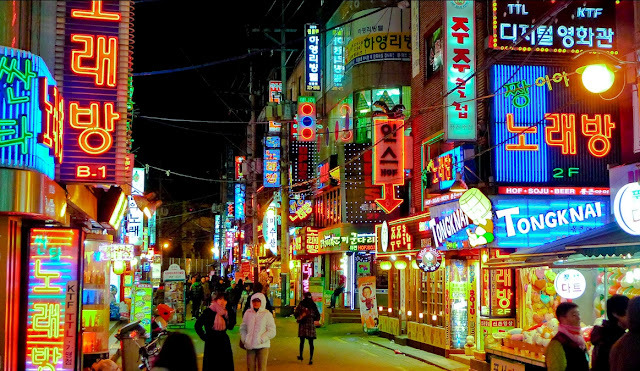 Saturday night is a time to explore Seoul’s awesome nightlife. Drinking and partying are pretty big in Korea. Clubs are packed and slightly overpriced, but still pretty reasonable, beers and cocktails are flowing. We usually head out around 9 or 10pm, grabbing a bottle of Soju (Korean spirit, similar to vodka) and a Powerade each to drink on the hour long train ride that takes us to Seoul. Our usual destinations are 홍대 (Hongdae) or 이태원 (Itaewon). Hongdae has been my favourite place to go for a night out so far. It’s the student area surrounding Hongik University. It’s full of people, students and those heading into the many bars and clubs. The streets are lined with stalls selling things like phone cases and earmuffs. There are also a huge number of street food stalls (the tradition of getting a kebab after a night out is still strong here) and you can also find delights such as sausage or fishcake on a stick. Finally there are the buskers. Buskers here get a bit more appreciation than they do at home, I assume they’re mostly student bands and they can gather quite a big audience around Hongdae. 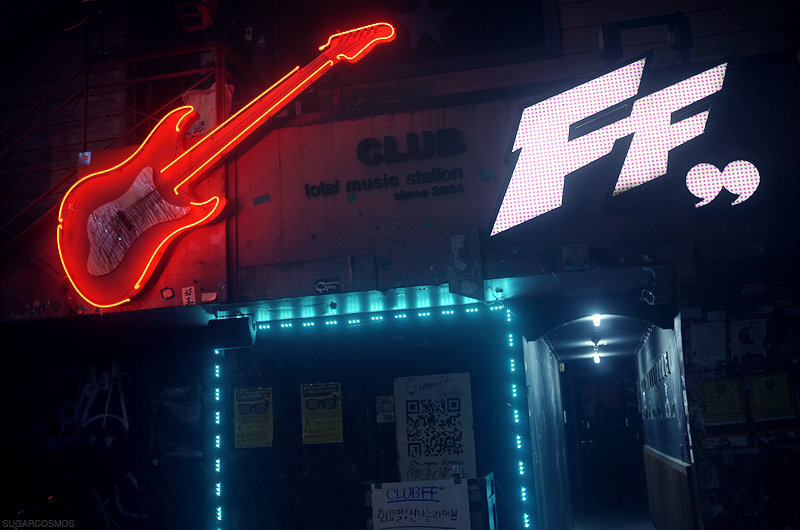 A club we often go to is FF Club and I’ve heard that both F’s stand for ‘Funky’. It’s an indie live music venue and it gives out free rum and coke/vodka orange for an hour starting at 11pm. 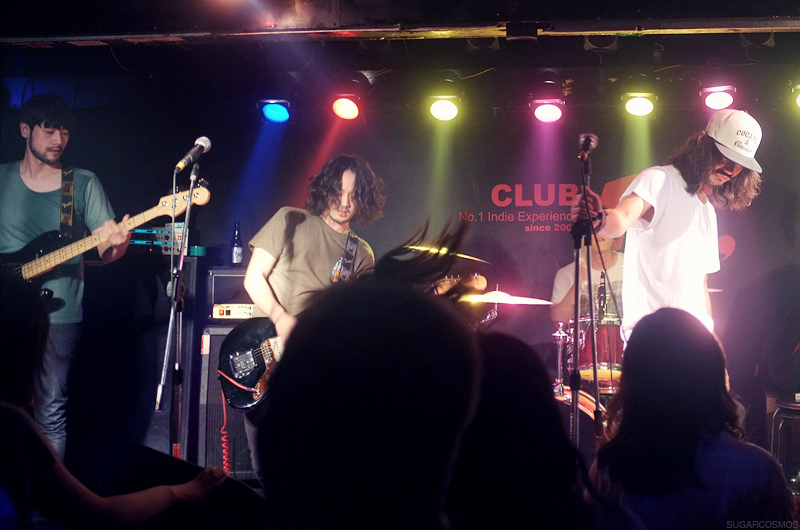 Starting around then are the live bands, usually Korean rock groups although we’ve seen one band from Ireland too. The bands are usually pretty good and the place keeps rocking with an in-house DJ until about 7pm. I should know, my first time in Hongdae and FF I managed to get separated from Joe and the others as I was with on the way to the subway station on our way home, around 3 or 4am. I charged around, more than a little tipsy, trying to find the station or Joe or a way to get home when I found myself back at FF’s. That took me an hour so I figured the best course of action would be to go back into the club, dance for a few more hours and see if I could either find a way home later or find some nice people who would let me stay with them. The latter transpired (sorry, Pirates of the Caribbean just started, I’m getting all Jack Sparrow-esque) and I found myself dancing with a small group of guys and girls who offered me a sofa. Around 7am the place started to close down, it was at this point that my new found friends informed me that they live 4 hours outside Seoul. Thanks but no thanks, I decided to make my own way. By this point it was getting light and everyone was heading towards the station so I found myself a train and got myself home. Turns out whilst all this was happening Joe, who had fallen asleep on the train, ended up on the wrong side of Seoul. By the time I got back to Gansoek and banged on the door I found that he had only been back for an hour himself. Two Tylenol later I was asleep. It was a good first night and Hongdae hasn’t let me down since. Another place we’ve been in Hongdae is Exit, a really smoky place that may have once been a large public toilet. I don’t like it, the music is repetitive techno stuff that I get bored of very quickly. Some others we’ve met have really liked the place though. On NYE Joe and I met Kerr in another big Seoul party destination, Itaewon. I’ve only been that one time (might go there tonight though). It used to be the go to destination for American GIs and they gave the place a pretty bad reputation, getting far too drunk and rowdy. Now they have a curfew and U.S Military Police patrol the streets and bars checking no one tries to break it. They even ID’d Joe when we were in a nice little club called Cake Shop. I’m looking forward to seeing more of Itaewon. Lots of people, including Joe, prefer it to Hongdae. One thing I don’t like about clubs here is the smoking. There’s no smoking ban here like there is in the UK and, despite having been a smoker myself, I can’t see why anyone would ever want to smoke inside. It stinks, you’re constantly worried about your clothes/skin near peoples burning cigarette ends and the next day your lungs feel like they’ve played host to a bonfire and fireworks display. You know a law is a good one when it seems crazy that people would ever want to do something the way they did it before. Four and a half minutes of cold seems like a small price to pay if you want a cigg. So that’s nightlife in Seoul. I’ve loved nights out here and tonight’s night out should be no exception. Now, it’s time to get ready. Note: The few photos in this blog are not my own. ( I haven’t wanted to take my camera out with me yet). If you would like to know where they’re from then message me and I’ll send you links and details. Links to the sites they’re from can also be found in the caption when they are clicked. This entry was tagged clubbing, Hongdae, Incheon, Itaewon, nightlife, Seoul, South Korea, Teaching abroad, travel. Bookmark the permalink. What about the Korean hotties? Most Korean girls I see are beautiful, and lots of fun. We were dancing with a few last night in Itaewon and they kept going till 5am. Is there a language barrier or do they speak English? Most of the 20-somethings that you meet in Seoul seem to have a pretty good level of conversational English. They’ve all been learning it for years and I think lots of them are university students who learn English as well as their chosen subject. But dance is a universal language and the music is too loud to allow talking most of the time anyway.